On Jan. 26, the Sarasota County Commission is expected to decide whether plans for a new Whole Foods and a Wawa at the intersection of University Parkway and Honore Avenue can go forward in spite of a county staff member’s assertion that the project will damage a rare type of wetlands. 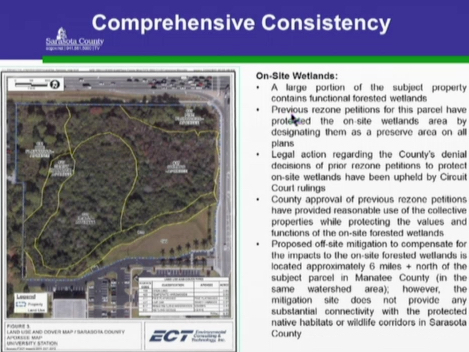 Language in the county’s Comprehensive Plan regarding such environmentally sensitive sites led to a 12th Judicial Circuit decision about 15 years ago that derailed an earlier attempt to develop the property, a county planner explained to the Sarasota County Planning Commission during its Dec. 17 regular meeting in Sarasota. However, a subsequent modification of that section of the Comprehensive Plan should enable the Whole Foods/Wawa project to proceed without fear of a similar judicial halt, members of the development team told the Planning Commission. 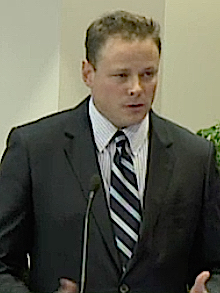 Moreover, the Whole Foods group has labored to put in place a mitigation plan in neighboring Manatee County, focusing on an approximately 34.5-acre parcel that is surrounded by conservation lands in the Manatee River Basin, Dana West, senior vice president of Environmental & Technological Consulting (ETC) of Sarasota, said on Dec. 17. 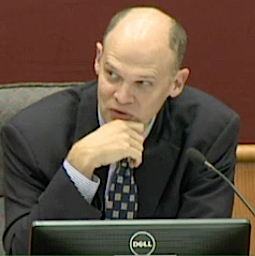 The County Commission tentatively is scheduled to hold a public hearing on the proposal during its afternoon session on Jan. 26, Leigh Sprimont, commission services manager for the county, told The Sarasota News Leader this week. The staff report for the Planning Commission explained that Whole Foods is requesting an amendment to the county’s Future Land Use Plan to allow the company to go beyond the commercial square footage limitation of 150,000 square feet in half of a Village I Commercial Center at the intersection of Honore Avenue and University Parkway. Whole Foods proposes an extra 54,055 square feet to encompass a grocery story of 40,116 square feet; 11,811 square feet for a restaurant and neighborhood retail shops; and the 6,128-square-foot Wawa, for a total of 189,957 square feet, the staff report added. Further, Whole Foods has proposed three shared access points for the project, including right turns into and out of the site on University Parkway; right turns in and out on Honore Avenue; and a traffic signal on Honore, the report continues. West, a consultant to the Whole Foods team, told the Planning Commission that while the Mall at University Town Center and a Super Target shopping center are in that area, no “community services” are available on the Sarasota County side of University Parkway. He added, for example that a person driving eastbound from the Sarasota-Bradenton International Airport to Interstate 75 has no place to stop for gas on the Sarasota County side of University Parkway between U.S. 301 and the interstate. “I have a tremendous amount of respect for you guys,” Morris told the Whole Foods team members, “but I don’t think we need to ignore that there is a Fresh Market directly across the street from the site,” as well as a nearby Publix. “There is not a lack of commercial and retail in this area,” Morris continued. “I don’t think you could find a higher concentration of retail and commercial in this area,” even if those businesses are on the Manatee County side. “Don’t insult our intelligence,” Morris added. No retail facilities exist on the Sarasota County side to serve the weekly needs of residents, Medred noted. “I tend to agree with that,” Planning Commissioner Kevin Cooper responded. Garrison told the board that he and his staff have been working in the community for the past year and a half, dealing with federal, state, local and regional environmental issues, to help Whole Foods determine the best location for its second store. In response to a question, Garrison said his firm works with the grocery chain on projects with significant environmental concerns. 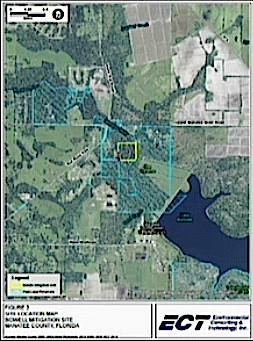 Additionally, during the public hearing, Alice Womble, a Center Ring Road resident whose property is near the University Parkway site, told the commissioners she supports the development, adding that the Whole Foods team had worked with her and her husband about their concerns. 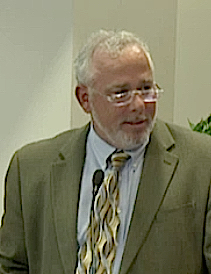 When asked whether Womble would benefit financially for her support of the project, Charlie Bailey of the Williams Parker law firm in Sarasota — another member of the Whole Foods team — said Whole Foods had agreed to build a wall on the Wombles’ western property line as a buffer, and it plans a new water line that will enable the Wombles and their neighbors to cease using wells for their water. 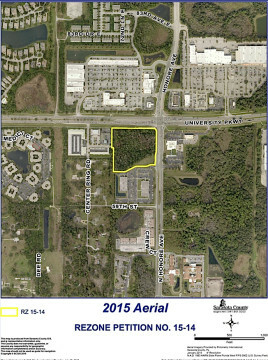 “These 4 acres [for the Whole Foods/Wawa project] are located at one of the busiest corners — only going to get busier — in Sarasota County,” Chairman John Ask pointed out of the site plan. 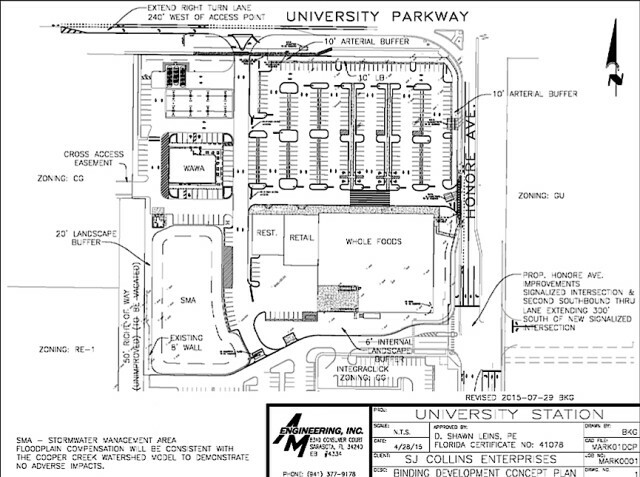 “Nothing that crawls, slithers or walks has the opportunity to move from this parcel to other native habitat without crossing University [Parkway] or Honore [Avenue] or other major roadway systems,” West told the commissioners. In response to a question, Kwamena Sankah, a technical specialist for Sarasota County’s Transportation Department, acknowledged that the affected section of Honore Avenue already is overtaxed. However, Sankah said, the County Commission has not authorized any funding to widen it in the next five years. Under current state transportation planning rules, he added, Whole Foods would pay a proportional share of the cost for improving the road to meet the extra demand the new development would be expected to create. “Mrs. Womble kind of put the frosting on the cake for me when she talked about the [wetland] and how much different it was 20 or 30 years ago,” Ask said. “I hope that this moves forward without being contested by some environmental people,” Bispham added.